Pixar's Up was a box office smash, adored by critics, and winner of two Academy Awards (for Best Score and Best Animated Feature). 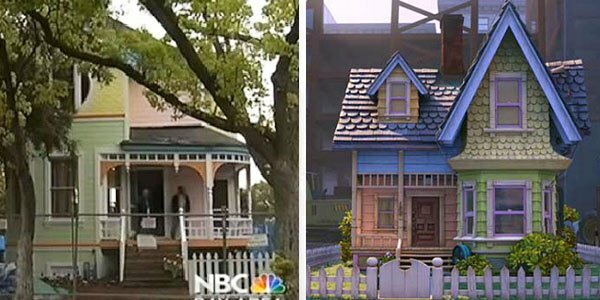 But it turns out the movie's charms aren't quite enough to impress cranky citizens of Santa Clara, California who are furious that one family has recreated the Up house's colorful exterior on their Old Victorian home. 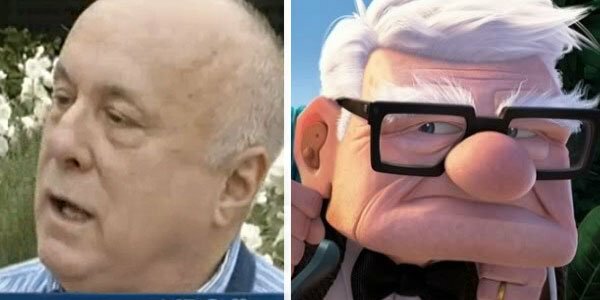 NBC brought our attention to the work of Hosam Haggog and Fatima Rahman, who have spent the past two years renovating their house in the fancy Old Quad neighborhood of Santa Clara to resemble the cheerful, multi-colored residence of Up's lovable curmudgeon Carl Fredricksen. Here's their house and Carl's side by side. "We're not trying to create controversy. We're trying to build a home for our daughters and our family. And that's what our intention was." Haggog added that he and Rahman's homage to Up was inspired by their daughters, explaining, "They love the movie Up and we just thought we'd give them something fun to be proud of. And actually all the kids in the neighborhood really love the colors." "I don't think it fits in with the neighborhood. It really, in my opinion, is atrocious that this Victorian is a gracious old lady, and it's been painted up to look like a clown." Looks like they have their very own cranky Carl in the neighborhood! Can we get this guy the assistance of a plucky, attitude-changing Wilderness Explorer ASAP! Residential peer pressure or not, Haggog and Rahman insist they've broken no codes or laws, and so their Up house will stay as it is. What's more, once the renovations are complete, Santa Clara's mayor has promised a block party to celebrate. Expect loads of balloons!